Tenleytown Main Street kicks off Art All Night with a special performance of music and dance from around the world as we celebrate the power of the arts to transform and transport you. 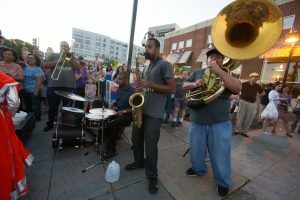 Then we bring the funk as Crush Funk Brass Band performs funky, jazzed up classics and modern songs. Dancing encouraged! Celebrate Art All Night here from 7-10 pm. The FREE American University shuttle runs every 15 minutes between the Tenleytown Metro Plaza and the American University Museum. Enjoy some funky music and then hop on the shuttle to visit the Art All Night venue at AU. Look for Art All Night signs marking the shuttle stop.